Hi All, Allie McMurphy here. We have a new release coming the end of July and I'm very excited about it. It gives you an insider view to the yacht races that happen on the island every year. Just as they are gearing up for the races this year, Mal and I discover a body floating in the marina. Let me tell you it takes a lot of effort to drag one hundred pounds of dead weight out of the water and up onto the grass area above the marina wall. I only got her halfway up before I gave up and called 9-1-1. Charlene, the dispatcher, was ready for my call. Officer Rex Manning was down in a flash and soon the harbor woke up to the murder of the daughter of a prominent yacht club member. The timing couldn't be worse as race weekend brings in the biggest amount of tourists. Then all the clues lead to my boyfriend, Trent's sister Paige. I have to get involved even when Trent's family circles the wagons and refuses to let me into the circle. Will I be an outsider forever? I certainly hope not. Finding the killer might go a long way toward becoming part of Trent's family. Let's hope I can figure it out. Have you ever seen or participated in a yacht race? If so, leave a comment below for a chance to win a copy of All You Need is Fudge. Cheers~ Allie. I've never seen or been to a yacht race, but it sounds fascinating. Thank you for this wonderful opportunity to win. I've never been to a yacht race! Lol'ed thinking about that on the river nearest to me. I really needed this post that popped up....good and happy distraction from what I was watching on my laptop. I've seen one on tv but have never been to one. I have never seen or participated in a yacht race but I imagine it would be great fun (and a lot of work)! Nope, closest I've ever been is sailboats down the river or out in the bay. Not a big fan of the water so would not like to participate in a race. Thanks for the giveaway. I've watched bits and pieces of the America's Cup over the years, but I don't know if that's quite the same. I live near very large lake and sometimes on weekends, there are sailboats races, which look very impressive with all the sails up and in the wind. Thanks so much for the chance to win! I've never participated, but have seen some on tv. Looks like great fun! Thanks for the chance to win a book! I've never seen yacht racing in person. I've watched a little bit of America's Cup on tv, but that's about it. However, I absolutely love your series, Ally and your stories! And I love that it's set in Michigan. :) I can't wait for this newest one to come out! Thanks for the chance to win a copy. :) rainstar76(at)yahoo(dot)com. Saw a race by Newport RI once. Never entered one; I can hardly swim. No never been or seen yacht races. I have seen them before but I have only competed in sun fish races. I have been to speed boat raves but never a yacht race, but I do love fudge! I've never been in a boat race but I have been on a few boats. It's fun but I don't like going too fast. Closest I've come to a yacht race is seeing the Great Steamboat Race that takes place a little before the Kentucky Derby each year. Though I have only ever seen that on TV. Thank you for the chance to win the latest in this great series. I have not been in a yacht race. But I would love to read the new book! Thanks for the chance to win! This is a great series! I can picture Mackinac Island and smell the fudge when I read this series. 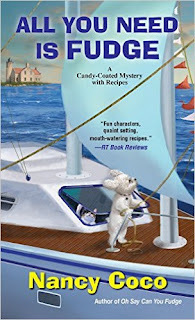 Love Allie and Mallow.Can't wait to read "All You Need is Fudge". No but have you seen that John Candy Movie Summer Rental? There was a regatta and they were racing against Richard Crenna. Very funny. A new Author for me thanks great review. I am adding this to my to read pile. Never been to a yacht race. Thanks for the chance to win one of your books. Have watched Olympic races and the America's Cup on TV. I have a painting of a yacht race from the early 1900's on my living room wall. Does that count?